The rock wall is a 35 foot four-sided climbing tower with a zip line. The sides of the tower offer more challenging climbs (with overhangs, chimneys, and mantles). The front facing wall offers two beginner -friendly climbing routes. Climbers are belayed by our trained facilitators to ensure the safety of each participant. (Belaying refers to techniques used to minimize slack and apply friction on a climber’s rope. These skills arrest a climber’s fall and are the way we anchor participants into our safety system.) The wall provides individual challenges while allowing for a single person and sometimes a portion of the group to participate at the same time. 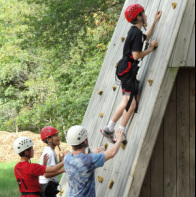 The rock wall helps develop the positive qualities of trust, perseverance, risk taking, giving and receiving encouragement, confidence as well as a sense of accomplishment and confidence. $20 per person (Please note a group minimum charge of $400 applies per activity.) Prices are based on group size. The length of time also depends on group size. The wall may be your group’s destination or it can be opened as one of many stations for small groups to rotate through or as an option for participants to visit at leisure. Approximately 10 - 12 participants can climb and zip in an hour. Up to 20 people can climb if both sides of the front wall are open and your group chooses not to zip. Please wear sneakers or rubber sole shoes that securely lace. Our High Ropes Course is a series of elements 25 feet or more above the ground and are belayed by our trained facilitators to ensure the safety of each participant. (Belaying refers to techniques used to minimize slack and apply friction on a climber’s rope. These skills arrest a climber’s fall and are the way we anchor participants into our safety system.) These elements provide individual challenges while allowing for a single person and sometimes a portion of the group to participate at the same time. 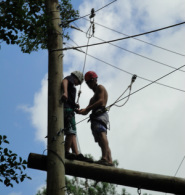 Positive qualities that high ropes develop are trust, perseverance, risk taking, confidence and a sense of accomplishment. BRIDGES: Bridges are a series of single elements. Individuals climb up a ladder system to traverse different challenges. Depending on the number of trained staff, it is possible for multiple participants to go, each proceeding only after the one before them has cleared an element. LADDERS: Jacob’s Ladder and the Centipede are single elements that allow individual climbers opportunities to make it to the top. The Giant’s ladder allows for two climbers to work together to get to the top. SWING: The group hoists individuals up into the air where they must pull a pin to safely free fall and swing. PAMPER PLANK: Individuals climb up to a platform and jump attempting to tag a suspended rope. The length of time to complete the course depends on group size and the elements you choose. 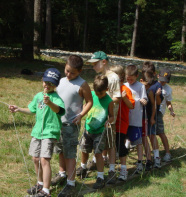 The Low Ropes Course is a series of real and imaginary obstacles designed to challenge groups to work together to accomplish a task. Users are encouraged to listen, respect, cooperate, collaborate, lead, follow, give and receive support and feedback, and to try new things. Our instructors will guide you through an individualized plan based on how your group is doing and feeling. Every element is “Challenge By Choice” – each individual determines their personal level of engagement. Whale Watch is a simple initiative requiring the group to balance a large platform for a given period of time. Nitro Crossing is a complex initiative where the group must retrieve a suspended rope and get the whole team with a bucket of water from one side of a restricted area to the other. Donut is a stacking element requiring the group to safely stack people in order to remove or replace a tire on tall pole. The Catwalk is a spotted individual element where each group member gets a turn to walk from one end of a beam suspended by cables to the other without falling off. $15 per person (Please note a group minimum charge of $200 applies per activity.) Optimal group size is 8-10 participants, but we can instruct groups of 6-12 participants. The length of time depends on group size and how well you already know one another. One and half to two hours is optimum. Please wear sneakers or rubber sole shoes that securely lace. Bandannas and water bottles are encouraged.